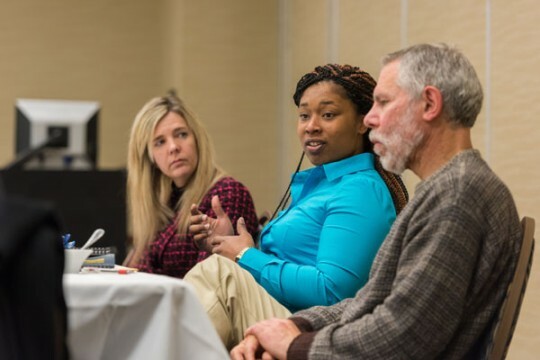 UM-Flint faculty discuss water crisis recovery initiatives. Since its founding in Flint in 1956 at the request of and with the support of community leaders, UM-Flint has been known for its involvement in the community. It continues today with campus leaders tapped to also provide community leadership. Faculty and staff such as Marty Kaufman, Margaret Andrews, Suzanne Selig, and Mike Lane were able to provide expertise and advice long before most people even understood there was a water crisis. These leaders are not just familiar on the University of Michigan-Flint campus. They are equally well known throughout Flint and Genesee County because of the many relationships they’ve fostered over the decades. 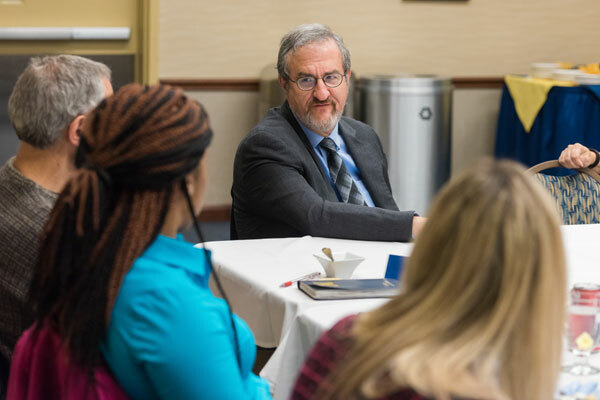 President Mark Schlissel was on the UM-Flint campus March 21, 2016 to discuss U-M’s response to the Flint water crisis with students, staff, and faculty. “For 60 years we’ve been an institution in this great community. When issues impact the city, they also impact the university, and it’s our role as leaders to step up and do what we can to ensure that the city recovers as quickly as possible,” Chancellor Susan E. Borrego said. UM-Flint’s engagement in the community includes more than 130 partnerships with agencies throughout the community and region—working to provide K-12 education, health, economic, and environmental leadership. Selig, for instance, has been a Flint resident since 1980—the year she joined the faulty at UM-Flint. 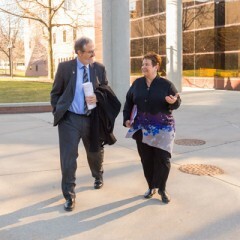 In her current role as a professor and the chair of the UM-Flint Department of Public Health and Health Sciences, one of Selig’s many tasks is to help the university strengthen its community-campus partnerships. “I have a very broad network of professional colleagues throughout the community and this network has emerged from relationships that I’ve had with faculty and staff members, current and former students, and boards that I’ve served on throughout the years,” she said. She is known throughout the region as an ambassador for public health, having served on the Hurley Medical Center’s Institutional Review Board for 25 years. With her longstanding reputation, it didn’t take long for local officials to call on Selig and several other UM-Flint leaders to provide their expertise. “One of the more notable things we did, with UM-Flint being so integrated in the community, was to develop a class to address the breadth of issues related to the crisis,” she said. Lane, who serves as UM-Flint’s director of Environment, Health and Safety, also was called upon early on to provide his expertise. He was a member of the technical advisory committee that recommended the city switch back to Detroit water before the governor ordered the change on Oct. 8, 2015. Lane’s longstanding relationships with the United Way of Genesee County, the Genesee County Health Threat Assessment Committee for Emergency Preparedness Planning, and other public service groups provided a bridge for community organizations that looked to the University for support. “The University of Michigan-Flint campus has a long history of working with community organizations. I have personally worked with a number of them on different emergency preparedness planning and health threat assessment issues, so as this water crisis became more evident they knew they had an ally here in the university,” Lane said. Coordinating with the Genesee County Health Department, United Way and others, nearly 3,000 water filters were given away to city residents during that first water filter distribution on Oct. 3, 2015. Whether it’s Andrews and the school’s nursing department working with the health department to administer blood tests of children around the community, or Kaufman and his team doing geographic information system (or GIS) mapping to identify the lead service lines in the city, throughout the six decades UM-Flint has existed, it has repeatedly proven itself an asset to the region. There are leaders all over campus, Borrego noted. Linda Dintenfass in Environment, Health and Safety also maintains key relationships with the Red Cross, and Paula Nas, interim director of University Outreach, coordinates with agencies across the county. Borrego herself also serves on the Hurley Board of Managers and Greater Flint Health Coalition, both of which also have been at the forefront of the water crisis issue. The University also is a partner with the Flint River Corridor Alliance, Flint River GREEN program, Flint Watershed Coalition, Flint River Corridor Project and also provides nursing care at Flint Schools, partners regularly with the Red Cross, and serves as a main gathering place for the many groups and agencies coming together to provide solutions for Flint.